﻿ Report from Dewayne and Rita Shappley. November, 2013. Mr. Juan Rivera Ruíz was baptized by Dewayne Shappley in Bayamón, Puerto Rico, Sunday, Nov. 10, 2013. María, Juan’s wife, has been a member of the Bayamón church for a number of years. A certified electrician, Juan, now retired, and María have been taking care of Juan’s chronically ill brother for a long time. -Barrio Cubuy, Canóvanas, Puerto Rico congregation. Two young people and a young man twenty years old were baptized is this church during November. I am reporting this as evidence of how this congregation continues to be active and effective in evangelism. Though they do not have a fully supported, local evangelist, a number of members are very involved in evangelism, both in their own area as well as in places up to two hours driving distance away from Barrio Cubuy, for example, in Barrio Guardarraya, Patillas and the town of Yauco on the southern side of Puerto Rico. 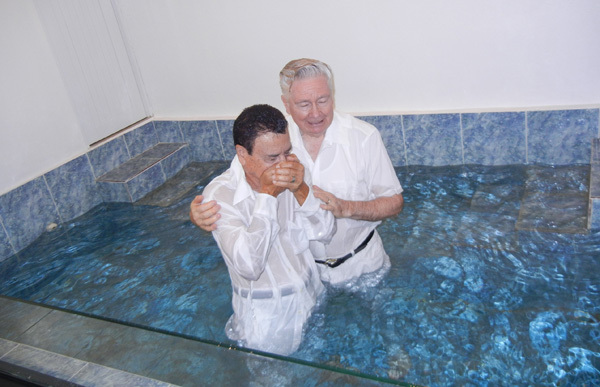 As a matter of fact, they also baptized a young couple in Yauco during November. -School of Advanced Bible Studies, Puerto Rico. Curriculum for Six Year Certificate formalized. Being fully responsible for courses studied to earn a Six Year Certificate, it was my lot to finalize the two year curriculum of materials to be covered by candidates. By the grace of God, I have been able to complete that task, providing teachers and students with all the material on a CD, that is, with the exception of a quantity of graphics I plan to add as time allows. Instead of using printed editions, students are required, beginning in January, 2014, to have the courses on laptops or other digital devices. Naturally, candidates for the Six Year Certificate must already have the Two Year Certificate and the Four Year Certificate. I continue to teach material for Postgraduates. E-mails and Relevant Info. Internet Stats. Stats on Antonio's site of hymns in Spanish. -Place not identified. Nov. 05, 2013. “Esteemed friend, …I liked the studies on Mark and Timothy. They are excellent, but this about Pentecostalism I do not like. Christ did a great work in my life, similar to that in the life of Paul, and the Lord Jesus Christ took me to an evangelical Pentecostal church. … The Lord is coming to look for his church, without stains or wrinkles. A church that is alive, and not denominations or religions. Christ is not religion. On my behalf, don’t mess up the beautiful work you have begun with the lessons. They are very nice, but don’t go the way of criticisms.” Ángel Guerrero. Referer: "http://www.editoriallapaz.org/pentecostales_iglesia_Jerusalen.htm"
-The studies on Mark and Timothy are part of a series on “The Ideal Church: Its Evangelists.”The reference to Pentecostalism is a study entitled “Zero Pentecostals in the Jerusalem Church,” the third in a three-part series on the “History of the church of Christ in Jerusalem.” This in-depth analysis broadened my understanding of various aspects of that church. Both series are taught in the School of Advanced Bible Studies, in San Juan. Of course, Angel, converted to Pentecostalism, did not like “Zero Pentecostals…” Very often do I lament that the first, non-Catholic, message heard by most people in Latin America was, and is, Pentecostal. If only our brotherhood had been, and would be now, more aggressive in evangelism. My reply to Ángel responded to some of his observations and beliefs. By the way, when he says “A church that is alive…,” he means Pentecostal, charismatic churches. Most Pentecostals strongly, even fanatically believe, they are God’s true people. Their churches are “alive”; the rest of the churches are “dead”, and lost. Data I have read shows there are more than a billion people in the world who identify themselves as Pentecostal or charismatic. I could not find any in the Jerusalem church, and that did not sit well with Ángel. -Place not identified. (Probably El Paso, Texas, judging by the e-mail address) Nov. 06, 2013. “Blessings for all. Thanks for your work in the Lord’s vineyard. The hymns are beautiful. For some time now I have been including a hymn at the end of my sermons recorded on CD.” Salvador Estrada, church, El Paso. Referer: "http://www.editoriallapaz.org/himnos_Cristo_Rey.htm" Reference is to the hymns sung by Antonio Shappley, about 170 available on his site www.alabanzas.info. -Worcester, MA. Nov. 11, 2013. “Very good material to be used.” Tamar Rosado. Referer: "http://www.editoriallapaz.org/apocalipsis_Capitulo1_contenido.htm" This reference is to Chapter One of the commentary on Revelation. -Responding to this e-mail, I asked Brother Pérez how the church in Madrid was doing, for, in years past, a Christian from this area of the world visited that congregation, observing definite departures from New Testament doctrine. As a matter of fact, Juan Monroy, after supposedly identifying churches he had established in Spain as like churches of Christ we knew in the 1960’s, later influenced almost all of them to use musical instruments and name women preachers. I personally possess no small amount of corroborating evidence to that effect. Ramón Pérez sent the following reply. -This is, indeed, good news about the church in Madrid. As I informed Ramón, there were 40,853 visits from Spain to editoriallapaz during the first nine months of this year 2013, promising contacts among them. -Barquisimeto, Lara, Colombia. Nov. 16, 2013. “I have found a lot of helpful material and am using it in articles I put on my Blog. But, in reality, this material so valuable seems not to be so known in churches of Christ, and not to be used so much by brethren. I am giving my impression.” Francisco Guevara Chafarded Referer: "http://www.editoriallapaz.org/demonios_desglosedelecciones.htm"
-As the Referer indicates, Francisco was on the Page which presents a list, with links, of a series of studies on “Demons in the Time of Christ and the Apostles.” Though his impression of the use of such materials in churches of Christ is that of one man in one city of the world, I doubt not, from personal observation and some feedback, that he is right to a disconcerting degree, the reasons being too many and complicated to set forth here. But, I will give an example of one recently brought to my attention, and it comes from his own country of Colombia. Eight people were baptized in a certain city of that country after much study on their own and much study of material on editoriallapaz.org. They soon found out the little group already meeting there had existed for 25 years, hardly growing any. After attending a few weeks, they observed the man preaching and teaching there for a long time did not venture far from the fundamentals of the doctrine of Christ, having the church spend an excessive amount of time singing songs. When one of the eight respectfully suggested they sing less and study more deeply, mentioning materials on our site, the preacher became offended, telling them the materials were too erudite, of all things, and that they should stop reading them and be content with what he offered! It was pointed out that they had come to the church precisely by means of the site and the studies! -On the other hand, not a few preachers and teachers of churches of Christ do testify to using the materials. Of course, there is no expectation on our part that most would, or even a large number. Much of the material is evangelistic in nature. All of it is set before the public with no pretention on our behalf about its being the best. All things considered, the consistently high number of visitors, in relative terms, I personally interpret as a positive indicator of its value, in addition to the many, many e-mails in confirmation. -Place not identified. “Esteemed brother, may God bless you greatly for the work you are doing. Twenty-two years ago (I was a young man of 17), you sent me Bible studies that helped me so very much. When I listened to the album on Galatians, I said to myself: ‘I want to be like them.’ Today, I am 39 years old, and I have prepared myself in the Bible. Believe me, you were my inspiration. I no longer have the album. I gave it to a brother. But, in my mind I still have the teaching and the voices of the expositors. Thanks, and God bless you always.” Luis Barríos. -That is really quite a beautifully worded and inspiring statement to me! The album mentioned by Luis was the first of four we did. Thirty-two studies, each about 27 minutes, on both sides of 16 cassettes and placed in a hard plastic album holding just that number. I did Galatians with Bro. Carlos Quiñones, of the Caguas, Puerto Rico church. He still attends there. Rita did almost all the work of producing thousands of those albums, plus large numbers of smaller sets and individual cassettes. -Place not identified. Nov. 22, 2013. “Not long ago, I was given the Book of Mormon and read it, but the truth is by doing it I just realized it is totally fatuous. In truth, I feel compassion for all the people who live in deceit. ‘My people are lost because they lack understanding.’ I thank God for the great blessing of knowing the truth, and being free. Let us pray for all those who ignore the truth and live in darkness.” Antel Lagunas Referer: "http://www.editoriallapaz.org/mormones.htm"
-To all these expressions I would just say: Amen! The only document on Mormonism we have on editoriallapaz.org recounts the sad and violent origin of that religion and examines its major tenants and practices. Antel was on that Page went he wrote. With one exception I remember, Mormons react to it with fanatical, irrational zeal. There are a lot of them in the Spanish-speaking world, many bought, from what I have observed, with material favors offered by that church. Many years ago, one of their leaders was baptized in the Bayamón church. -The Referer shows Luis wrote when he was on the Page of the study “Original Sin. Romans 5:12.” “What sin entered through Adam?” asked Ramón, of Santiago, Chile. Since I myself desired to better understand Romans 5:12-21, I dedicated no small amount of time to the text, writing two rather lengthy studies, sharing them with Ramón and, through the Internet site, with anyone else interested. Also, taught the material in the School of Advanced Bible Studies in San Juan. -Apure, Venezuela. Nov. 26, 2013. “Very interesting.” Sr. Rivero [Mr. Rivero was on the Home Page of editoriallapaz when he wrote, so maybe he found the whole site “very interesting.” Hope so. Antonio has verified that we have 9,248 external links to editoriallapaz.